Location: In the block of buildings between Douglas Road and Rhiw Bank Avenue. 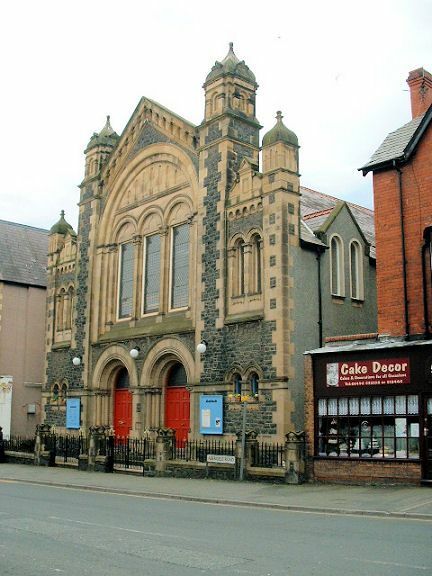 The church was opened in 1885, but was altered or rebuilt in 1901-3, to designs of Rowland Lloyd-Jones, architect/builder of Caernarvon. Grand front to Abergele Road, housing entrance lobby and staircases, narrower 4 bay chapel, with lecture hall ect. as cross range to rear. Entrance front is black random granite with freestone dressings. Slate roofs with tiled cresting. Flamboyant Neo-classical facade forming a giant pedimented gable flanked by pilasters terminating in ogee caps. Giant arch beneath the modillion cornice of the pediment houses paired doorways with coupled shafts, and three round-arched windows inset above. To either side of the main gable, the smaller stair towers have paired round-arched windows graded in height, and scrolled composite pediments. Chapel itself is a 4-window range behind, the lower windows with flat stone lintels, round-arched windows above, all with margin light glazing. 2-storeyed 5-window range lecture hall to rear has similar flat-headed windows with margin light glazing, and is articulated by pilaster buttresses defining each bay. The chapel is enclosed to the frontage by a low stone wall with ornate scrolled and twisted cast iron work to gates and railings. Richly detailed interior, also employing a flamboyant Neo-clasical vocabulary. Raking floor level and horse-shoe gallery, with wood panelled parapet with some low relief decoration above modillion cornice, carried on fluted cast-iron columns with high twisted bases. Shallow segmental boarded ceiling with turned king post and tie rod trusses over central space, ribbed panelleing in flat ceiling to either side. Ornate aedicule to organ recess in S wall. Deacons' pew and pulpit with shallow arches to rail; panelled curved stairs with turned balusters to either side.